I am not winning NaNoWriMo this year. I guess I didn’t even really enter it. This is the first time in years that I haven’t even tried to do NaNoWriMo. Even though I am not doing NaNo this year I’m still being productive. I’m finishing the last little bit of book two, and three for my litRPG series. I also took the first week of November to finish edits on book one, and publish it. It’s precisely because I’m doing all the edits right now that I am not participating. Edits take longer, and make fewer words,but are still incredibly important to get a book out. And I want book two or before Christmas! But maybe I can have my own NaNo in January or something. We will see. First: Let’s get these books out! It’s been a week of editing and cleaning things up. Not just the short story and novel I’ve been working on, but also some artwork. I’ve been doing the second draft for book two in my Half Blood Sorceress series. I’ve been taking a little more time with this one then I did with the Mermaid’s Curse books because there are a lot more characters. The continuity has to be there, which has resulted in a lot of rereading of the first book, and putting together a writers bible for this series about characters, their looks, and their history so I get things right. I’m sure I’m going to miss things still, but I’m going to do my darndest to get at least the plot right. Then off to an editor, of course, to get the grammar/spelling right. I’ve also been working on a short story, Ghostly Intentions, about a young man who returns to the his childhood home to find a creature inside it. Lots of magic, and a few ghosts to work with. It’s going to be a novella when I’m done. Then there’s the art. When it get’s too busy at the day job I can’t really write, so I doodle a lot, and some of those doodles become decent drawings. I’ve been working on things to do with them, pins, stickers, prints, etc. I have an etsy here where you can get digital prints, and a redbubble here where you can get some shirts and cups. I’ve even made some pins and charms, but I’m not sure if they are working out well. Anyway, this is just a quick update. I’m hoping to finish Ghostly Intentions soon to get that out, while still working on the new Half-Blood Sorceress series. Today has been pretty busy, so far. We went out to a birthday lunch with friends, went shopping to get supplies for Gregg’s armor that he’s making, and I cleaned up the house a bit. Then I came home and I spent a few hours playing a game. This was a much needed mental health moment because I know I’m going back to work tomorrow, and I needed some time to just have a little fun, and veg out. Most people watch TV for that, I play video games. But now it’s time to get back to work, so here I am writing my morning pages in the evening. It’s 9, and I usually go to bed at 3am or so, so there is plenty of time. Over the last few weeks I’ve been stuck between editing and writing. There is a huge difference in mind sent with both of these. If I’m writing I just put the words on paper, and let them flow. Easy. I sometimes get a thousand words in less than an hour. It feels productive, and if I actually did it for more than an hour a day I would probably be able to keep up with everyone else. With the writing at least. But once that first draft is out I need to do the revise. Read through, clean up spelling, grammar, rewrite a few sentences. Add in bits that were missing, or sometimes add in whole chapters. This part takes me forever. I need to figure out a better way of doing it. It doesn’t matter how good or clean the first draft is, there are those little bits of filler that I need to put in so that the 50k words make one sensible story line instead of just scenes strung out on a page. I don’t know why, but reading back over my words is really tough to do sometimes. I get so easily distracted, or just space. Probably because I know what’s going to happen, and I just can’t stand to read it again so soon after writing. Maybe if I put it in a draw for a while it would be easier, but I’m going to have to write a LOT to be able to do that. I have been doing a lot of reformatting lately. Adding in better back matter, adding in a little notice about the news letter and a offer of a free book. Little things here and there that take forever, but they go a long way to making a book look professional. It’s amazing how much my ideas of a “finished” book have changed over the last two years. Even my covers have improved dramatically. But none so much as my print books. When I first printed the original print editions of my various books I did okay, got the right page size and put the beginning chapter on the right side of the book. I even added a page of reviews so anyone picking it up might see that I had at least some accreditation. They looked good. 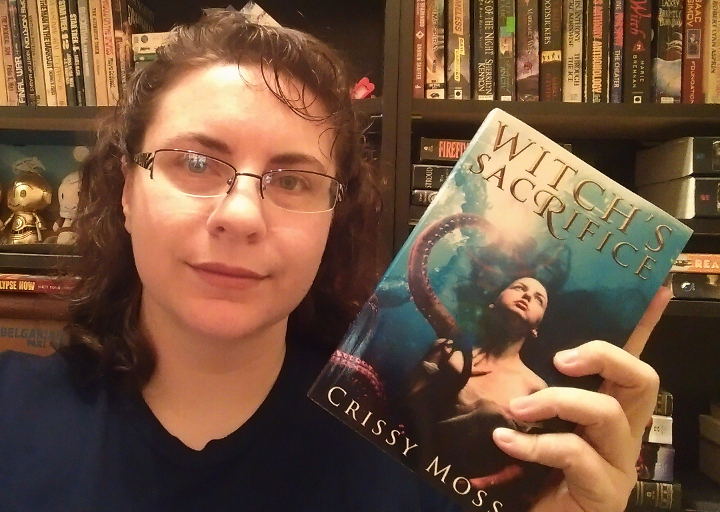 When I got to “Witch’s Sacrifice” I did everything the same way, or so I thought, and ordered the proof. The text was itty bitty and could barely be read. I adjusted, sent a new one and found that I forgot to add the front matter. Tried again, upped the font size and added the front matter. Adjusted the table of contents since that always changes when you adjust the font. This version was readable, but I still wasn’t quite happy with it. It turns out I was using the wrong sized pages when creating the print files for “Witch’s Sacrifice.” That meant when it was shrunk down by Create Space the font shrank with it. When it printed the text ended up being off in every way, as did the page numbers, maps, and everything else. I didn’t bother changing it after the last time. The text wasn’t too small, so it didn’t look horrible, but it wasn’t exactly what I wanted either, but I knew that I’d have to get to it eventually along with all the other little things. Last week I finally took a few days to start reformatting. It is amazing how big a difference it is just to have everything the correct size. 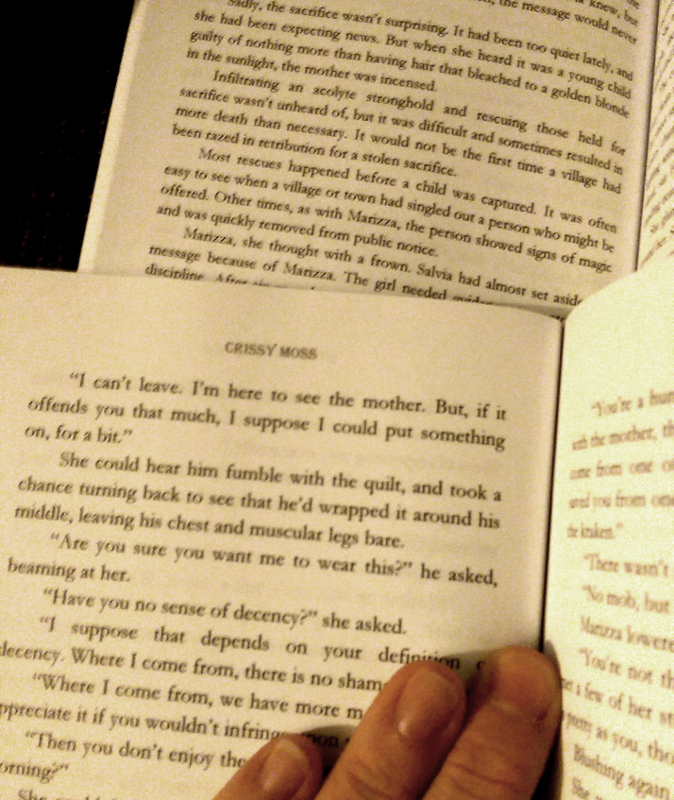 It’s about a one hundred page difference. After adjusting the size of the page and putting in the correct size text made the book feel more substantial, like a real novel. I got the new and improved version of “Witch’s Sacrifice” today, and it’s beautiful. It’s everything I wanted it to be, and now I know how to format the other two. “Witch’s Stand”, the final book in the series, will be going to the editor next week! I will also be getting the cover done at the end of the month. That means I will finally have a finished trilogy! SQWEEEEEEE! There is one more story in the Witch’s Trilogy, and that’s a short story about Salvia, the little mother, and how she learns that she is a witch. I haven’t decided if I will be giving this away for perma-free, or just sharing this with my newsletter (though my newsletter will get it long before anyone else does.) However, once that is done I will be putting out a combo pack that has all four stories in it. I will hopefully have the other print books out as well, and might also get a print book of all four together depending on how long it ends up being. But right now we’re getting ready for RadCon. If you’re there let me know, I’d love to meet you.